Let’s talk tires for a moment. Countless videos on YouTube document a piece of factory technology on most makes and models of motorcycles that is the source of some real sphincter-clinching moments for motorcyclists when riding off-road or when encountering a series of potholes in asphalt or concrete. It’s called the kickstand kill switch. Its purpose is to prevent riders from forgetting the put the kickstand up before riding. A logical idea (that’s probably backed up by some statistics? ), but with some real practical limitations in its design and implementation. The kill switch a button that is linked to the electrical circuitry of the motorcycle. When depressed by the kickstand the circuit has no faults and the motorcycle is functional. However, if a rider hits a pretty good bump the kickstand can bounce away from the button, which then creates an electrical fault in the circuit and abruptly turns off the motorcycle. Pucker factor moment… engage. I need as few of these moments as possible in my Great Divide Trail ride, especially since I’ll be off-road most of the time and carrying additional weight. I’m going to remove it now rather than take my chances later. Here’s a rider from GlobalRiders.com conveying his frustrations with the kill switch on his BMW motorcycle (at the 4:08 mark). If you watch the series called, Long Way Down, which I highly recommend (Netflix), with Ewan McGregor and Charley Boorman, you’ll find Ewan runs into the same problem whilst riding on his BMW through Africa. Let’s parlay this over to my 2008 Suzuki DRZ 400S. It’s almost the exact same system. There’s a connection under the seat of the DRZ that looks like this when disconnected. 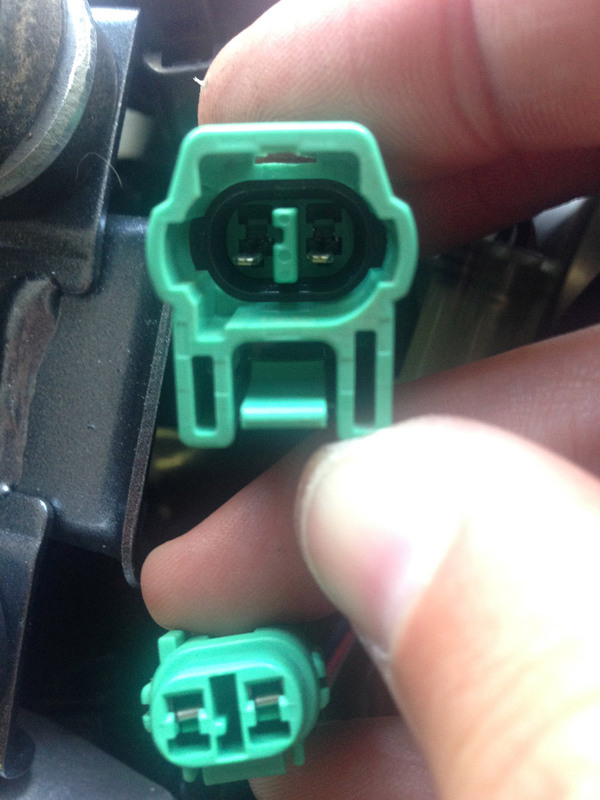 The bottom connector plugs into the top connector with two tongues, one for each wire. 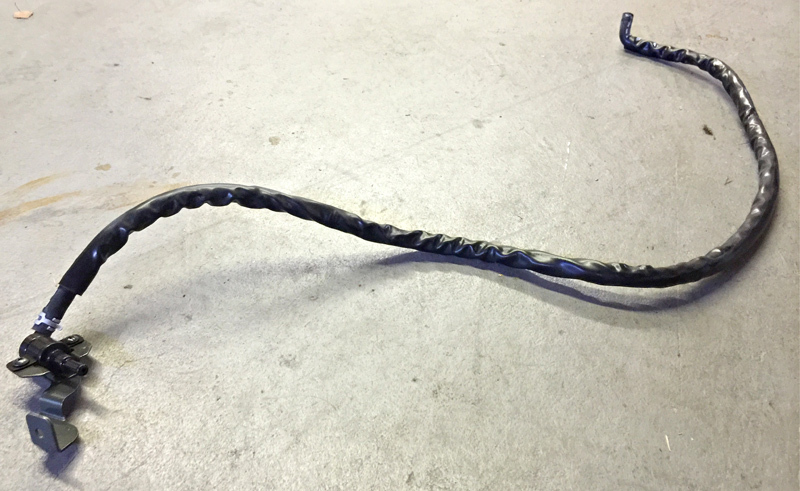 The bottom connector is attached to an 30-inch-long 2-wire lead that snakes its way down the bike frame to the kickstand kill switch. I cut the wires about 3 inches below the bottom connector in the image above. I then slapped one of these onto the ends of the wires of the connector. 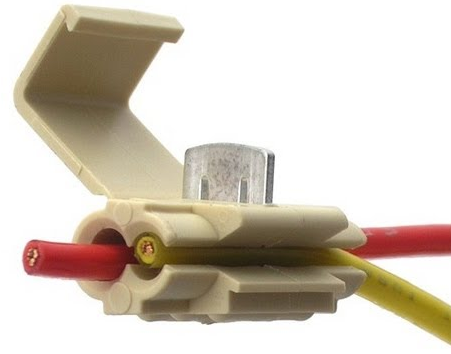 These wire tap splice connectors can be bought at Radio Shack (if they’re still around) or Walmart. I inserted the two wires, and with pair of pliers, pressed down on the metal tab which electrically connected the two leads. Lastly, I folded over the plastic lock to complete a very clean and stable modification. This will now forever fool the circuit into always thinking the kickstand is up regardless of its actual physical setting. Doing the work under the seat should provide a bit more shelter from climate and other riding effects. The last step is to unbolt the kill switch from the frame and pull it and the 30 inches or so of wire off the bike. If all you do is street riding it’s not imperative you do this. The spring tension holding the kickstand in the upright position should be strong enough for most street riding situations. But if you plan on riding your motorcycle off-road, I suggest you perform this modification. Pure dirt bikes don’t even come with a kickstand.